I was the kid riding the young green TB in pony club that had all the pony club moms covering their eyes. It wasn't that I didn’t have access to other breeds; it was just that I wanted to ride a thoroughbred. I was lucky enough to have a family that was involved in the racing industry. I worked at the track and help break the babies at the farm. My mom ran the layup barn, taught riding lessons, and did a lot of sales of thoroughbreds. I was very involved even at a young age with restarting our thoroughbreds that were off of the track. It probably isn't something to brag about, but I have always had the reputation of being the person that would ride anything and could bring along a really tough horse. I really enjoyed the quirky TB's and the tougher they were, the more determined I was to work with them. I have a lot of patience (or I was humbled into developing a lot of patience :)), and I enjoy getting into the horse's heads to figure out what made them tick. 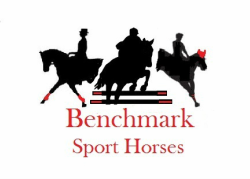 I have spent the last ten years heavily involved in the retraining and resale of OTTBs. I pride myself in developing really nice OTTBs that have solid basics installed into them that allow any amateur rider to pick right up and go with the horses that I have retrained. I have an excellent reputation as a good trainer and an honest seller. I worked with CANTER Mid Atlantic retraining the donated horses as well as bringing along my own sales horses. You can read the CANTER Mid Atlantic blog which features the retraining of each horse that came into my farm here- http://dixierumble.wordpress.com. My work with CANTER gave me access to a wide variety of horses: quiet, hot, small, big, quirky, easy, talented, sound, sound with prior injuries, confident, lacking confidence, tough mouth, really soft mouths, and every sort of issue you can think of. Working with a diverse group of horses requires me to think out of the box and train each horse as an individual. I believe that I have a very large toolbox that enables me to be successful in dealing with horses of every sort. I am far from the perfect rider, but I do a good job of figuring out horses and teaching them to be solid citizens. I have no timeline or fixed agenda. I allow the horses to guide me in the direction they want to go, so that we work as partners. I am a quiet rider who is soft but tough when needed. I have an excellent knowledge of what type of feed program works best for OTTBs and allows them to build weight and muscle without having any adverse effects such as being too hot. I understand saddle fit and how that affects the performance of OTTBs. Therefore, I pay attention to properly fitting tack so that the horse is comfortable and not hindered under saddle. I tailor my turnout situation to creating the most relaxed horse possible. I am excellent at figuring out any underlying issues that an OTTB may have and treating them to get them comfortable again. I work with an excellent farrier which is essential in ensuring we have a comfortable horse. No foot no horse! The dentist and chiropractor play a large role in my program as well to ensure optimal comfort and physical performance of the horse. My extensive experience allows me to understand how a horse’s job at the track will correlate into retraining. I can recognize when a horse is muscle sore and whether I need to back off or push through it. I believe that I do a really good job at bringing a horse along on the flat, so that they develop the correct muscles without getting sore or cranky. I am especially good at dealing with horses with confidence issues. I have reformed horses that wouldn't get near a pole on the ground into successful jumpers by taking my time to build their confidence. I restart the horses beginning with some basic lunging and ground work to teach them about accepting the contact, going forward and understanding basic voice commands. My flatwork is always done slowly working the horses from back to front. Really focusing on going forward and working into the contact. I teach all the horses basic lateral work moving from inside leg to outside rein in both directions. I believe that grids and jumping should always be part of the program for all horses even in the earliest stages of retraining. It helps them build muscles and avoids over drilling them on the flat. I try to ride my horses out of the ring as much as possible. We hack off the farm and we also take many trips off the farm to get the horses used to going new places. We may just start with traveling and doing a 15 min trail ride and work up from there. We will take the horses to xc schoolings, starter competitions, chases/paces and much more depending on how long they are here. 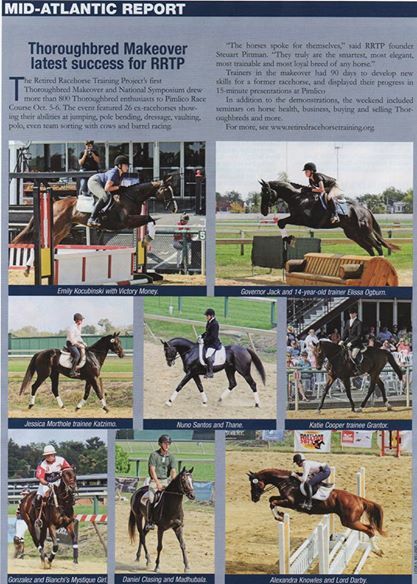 In 2013, I was selected as one of the trainers for the Thoroughbred Makeover project. I was able to show the process of bringing along an OTTB from start to finish.